Councillor Cochrane said: “I would like to congratulate Eilidh and all the pupils who entered the competition for the quality of their calendars. Copies of Eilidh’s colourful calendar have been printed and are now available free from many South Ayrshire Council buildings and local libraries. 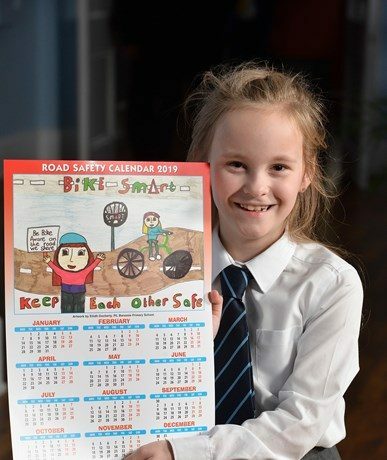 Eilidh Docherty with her winning entry in the Ayrshire Roads Alliance’s South Ayrshire Road Safety Calendar 2019 competition on Thursday 29 November 2018 in Troon, South Ayrshire. With Eilidh are Councillor Peter Convery, Councillor Ian Cochrane, Angela Swan (Junior Road Safety co-ordinator), Mary Garrett (Assistant Road Safety Officer), Councillor Craig Mackay and Councillor Philip Saxton.